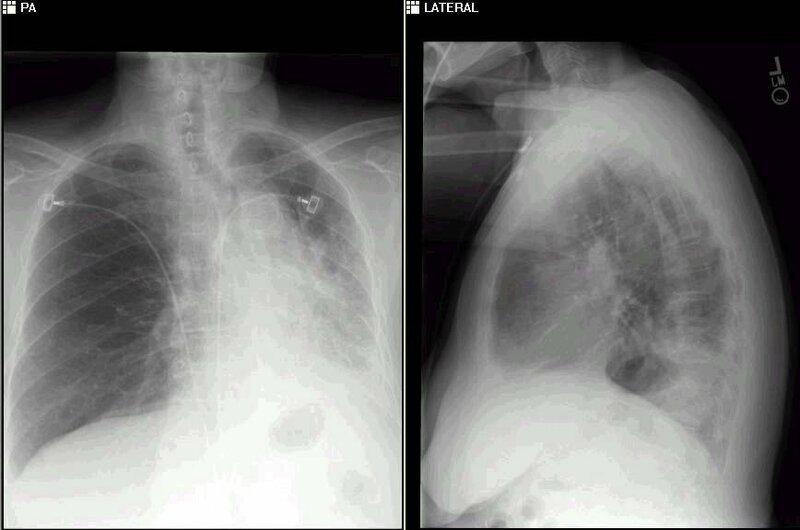 We were asked to see this 74 y/o woman for dyspnea and atypical chest pain. She has a long TOB Hx (>50 p/y) and continues to smoke. Last year she had a "lump" in her neck (it was benign) and had an unremarkable neck and chest CT scan. For the past 2 weeks she has had worsening dyspnea and a cough productive of blood-streaked clear sputum. No othe significant PMHx or exposures. This was an interesting consult: 75 y/o woman with depression (lost her husband a month ago) and chronic back pain came in for an elective laminectomy. She received rapid induction with Propofol and succinylcholine and was intubated rapidly. She then had sudden bradycardia and hypotension with hypoxemia and her continuous end-tidal CO2 indicator dropped precipitously. They cancelled the surgery and gave her dopamine and fluids. She had a rebound tachycardia with dopa, was given neosyn. and cardiology and I were consulted. What other info would you want? This is the 65 y/o man with FUO and palmar and plantar lesions. Since the post his temperature curve has come down nicely on ceftriaxone and doxy. He still has the skin lesions and blood Cxs (after 7 days incubation) are still negative. He is having a TEE today and RMSF and Coxiella serologies are pendng. His RF was negative but he had a +ANA with +Anti-RNP (Anti-DS-DNA, Anti SSA and SSB and other SLE markers are negative) and his CRP has come down from 30s to 20. Any other ideas? So to make a complicated story more complicated- when I spoke to our pathologist about the biopsy results he said "I never seen anything quite like this in my career." 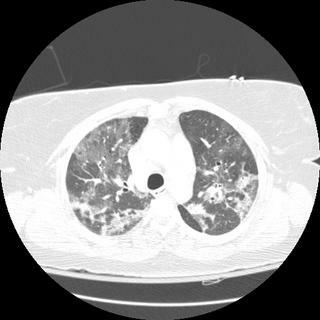 A prominent lung pathologist from another institution was in agreement. Chronic interstitial pneumonia and patchy interstitial fibrosis; chronic active bronchiolitis with focal proliferative-type bronchiolitis obliterans and organizing pneumonia pattern; focally necrotic granulomatous inflammation. 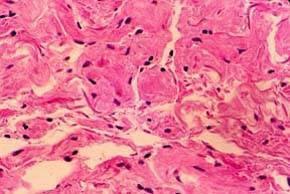 fibrosis. 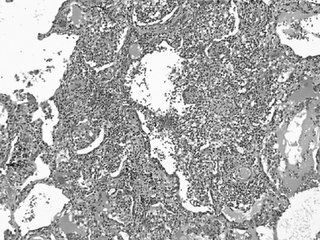 Lymphoid aggregates are present, and many of the interstitial cells are plasma cells. 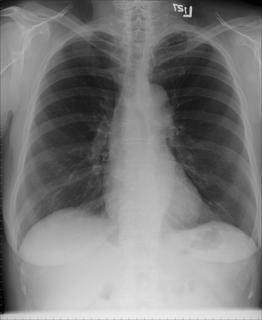 Superimposed on this picture are numerous granulomas, some of which show focal necrosis and acute inflammation. 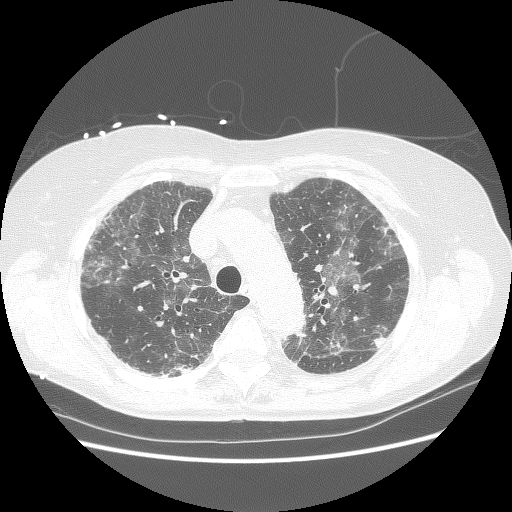 A few of the granulomas appear bronchiolocentric. Rare bronchioles contain intraluminal foci of granulation tissue. Special stains are negative acid-fast bacilli and fungi. The background interstitial inflammation and fibrosis may be related to the patient's rheumatoid arthritis. 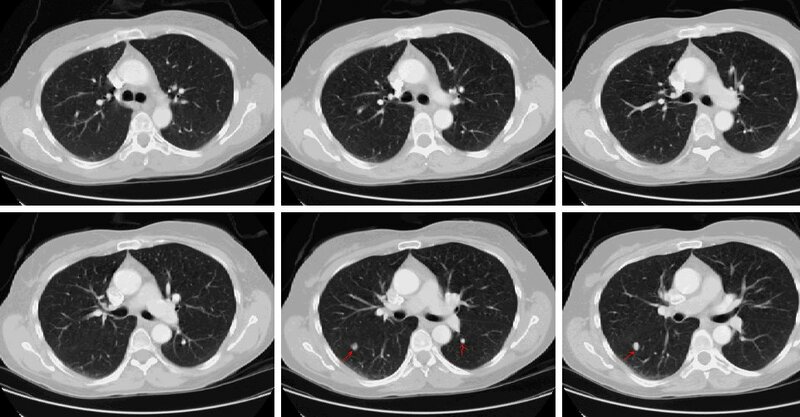 In that series, all of the patients improved with a combination of immunosuppressive therapy and discontinuing etanercept. 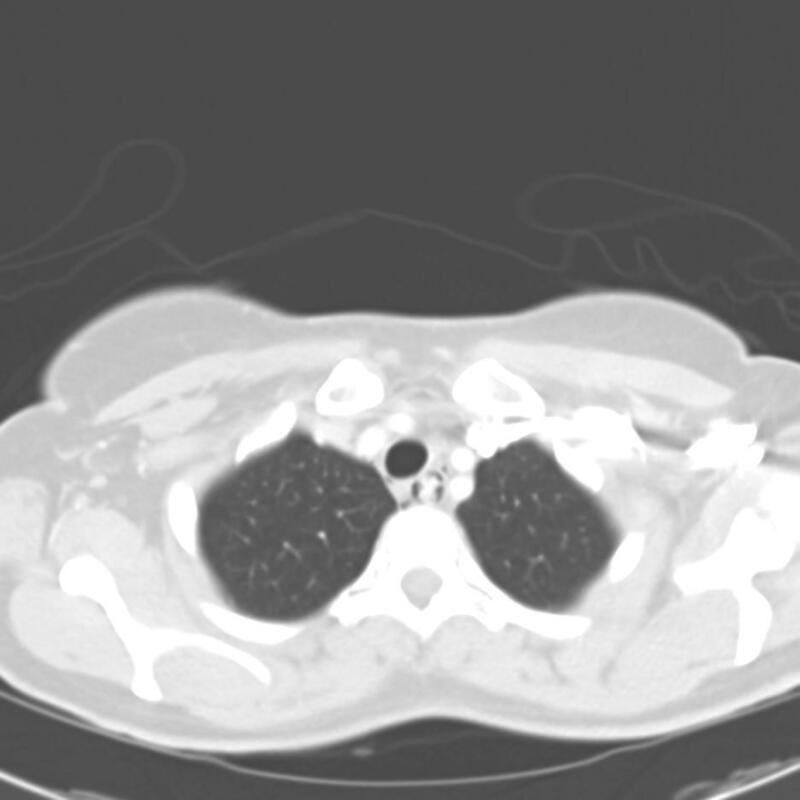 This patient has clinically stabilized but has been slow to improve. Posted by Jennings for Dan. This is a bit of a long case (to make up for my lack of recent posts) that I think has an answer... See what you think. I'll post some followup later today or tomorrow. 52-year-old gentleman with a history of rheumatoid arthritis diagnosed 15 years ago for which he has been on Enbrel for the last 4 years. The manifestation of his rheumatoid arthritis was mainly joint stiffness in the hands and ankles which was completely relieved by Enbrel, and remained well controlled. 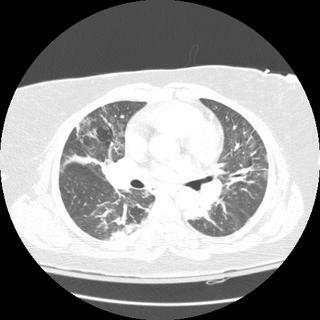 He had no respiratory symptoms until 2 months ago, when he developed a dry cough. The cough worsened and then 4 weeks ago he developed high intermittent fevers. His temperatures at home were as high as 103 to 104 degrees and were accompanied by symptoms of chills and sweats. He was treated with a course of Augmentin to which he did not respond. Prior to the onset of his symptoms he was doing work remodeling his attic and reported possible mold/fungus exposure during that time. He denies any known contacts with active tuberculosis, prior positive PPD, sick contacts, or travel. 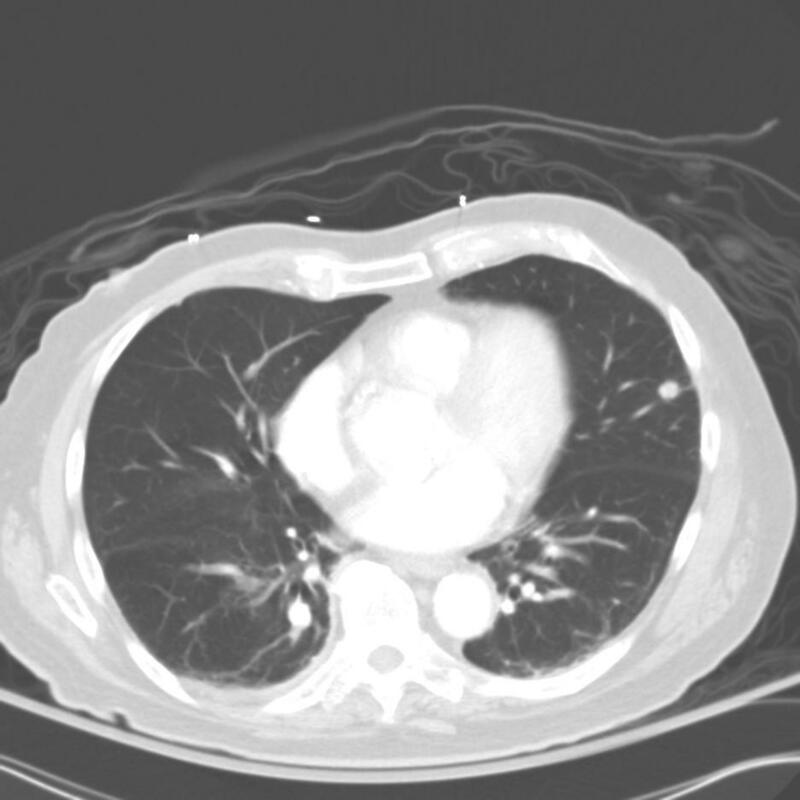 He was then hospitalized and underwent a pulmonary embolism protocol CT scan which was negative for PE but showed a dense right middle lobe and right lower lobe infiltrate with surrounding patchy ground-glass opacity. Blood cultures were negative, 3 sputum samples were also obtained were smear and culture negative. BAL at that time was negative for acid fast bacilli, fungal, bacterial, or viral organisms. Cytology was also negative. taper of prednisone, and his enbrel was held during his hospitalization. He underwent a repeat chest CT prior to his visit which showed no interval change in his infiltrates (see below). I initially saw him 3 weeks after his hospitalization. At that time he was on 30 mg/day of prednisone and reported that his fevers improved, but he remained severely dyspneic and continued to wear home O2 at 3 liters per minute. Social history: He works as a utility supervisor for a university. He smoked 30-pack-years and quit when his symptoms began. His job did involve some remote asbestos exposure as well as frequent exposure to steam vault tunnels. 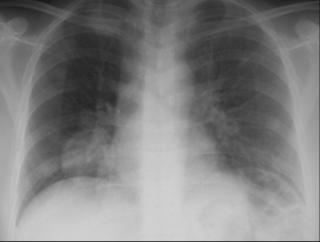 -crackles lower 1/2 R lung field and L base. chlamydia, cryptococcus, and legionella were all negative. 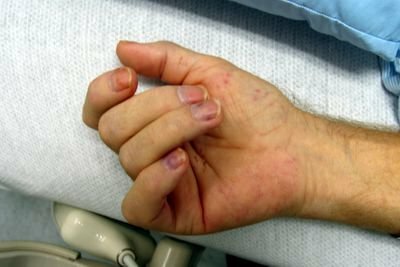 A bone bone marrow biopsy was performed and was negative for granulomas, acid fast bacilli, fungus, or bacterial culture, and was otherwise normal. CBC, serum chemistries, and LFT’s were normal with a normal differential. How would you proceed at this point? 87 year old man with no PMH presented to his PCP with mild SOB. No cough. No constitutional symptoms. He is a non-smoker. This is my Wednesday case; feel free to email the posting schedule, however. 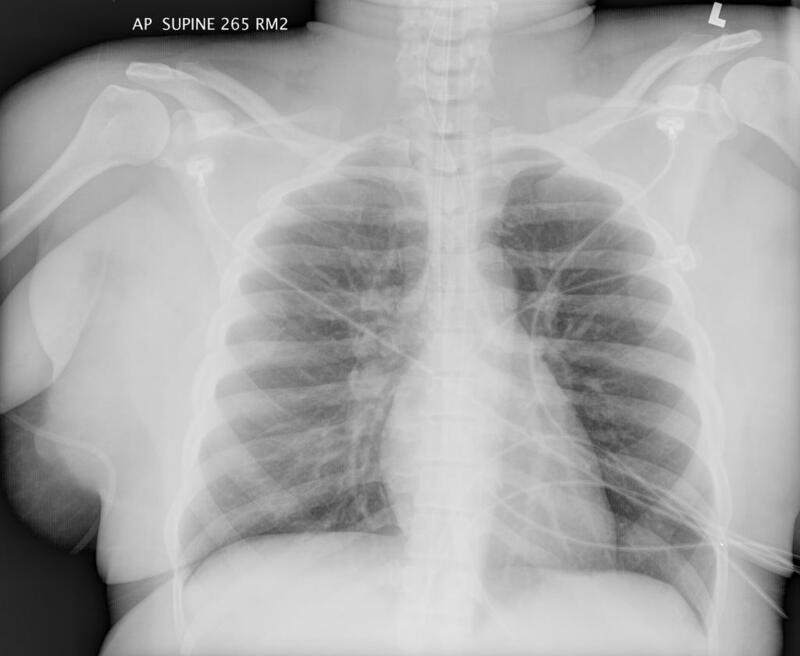 35 yo female post-partum x 7 weeks (healthy newborn girl; no complications with pregnancy or with birth) with no PMH presented with the sensation of food getting caught in her throat after eating a large steak meal. EGD was performed with foodstuff visualized in the proximal esophagus. It was pushed successfully into the stomach. Post-procedure, the patient had onset of fever (38.5) on one occassion and mild chest pain that resolved without intervention. Her WBC count was normal and did not change throughout her hospital course. 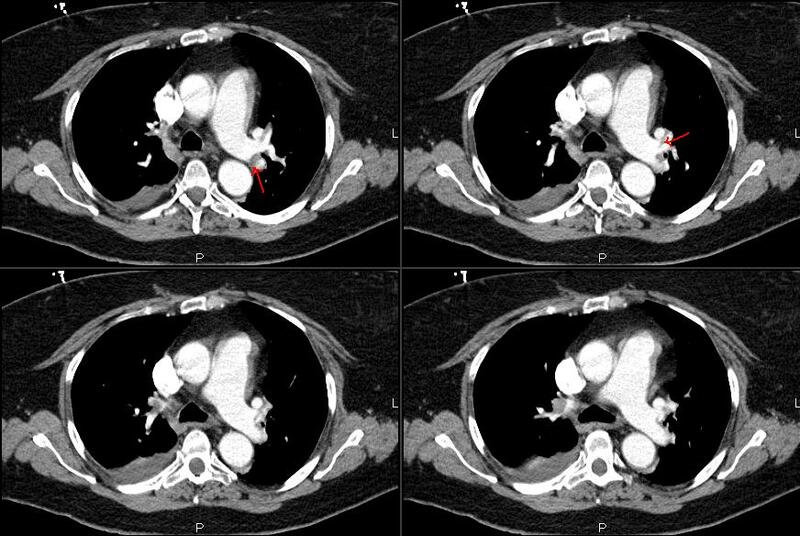 A CT chest was obtained to evaluate. Anyway, I see a lot of older patients with no obvious structural pulmonary or cardiac abnormalities and just want to compare notes. To ilustrate it, yesterday I saw this 60 y/o woman with "episodic DOE". She is fairly healthy, exercises regularly on a treadmill and was sent by the cardiologists after a normal radionuclide stress test (normal EF too). She notices dyspnea with chest tightness when she tries and exerts herself "faster than usual" like racing up the stairs. Her daughter got married a few weeks ago and everytime she went up to get something she would get dyspneic. No F/C/NS/cough. No TOB. Occ social ETOH. On a PPI, Calcium and prn Tylenol. Normal PFTs (FEV1 and ratio, TLC, no air trapping and DLCO~101%). She had had a normal chest CT and we did a Mathacholine test which was negative (~10% change in FEV1 after 25mg). What would you do next in this case? Do you see a lot of this less obvious cases of DOE? This is not so much a diagnostic dilemma, as a therapeutic curiosity. Think of it as a riddle. This is a very nice lady whom I cared for about 5 years before she was lost to follow up because of an insurance change. She initially came to my clinic after being followed by another colleague who left the University after finishing training. This lady had very severe asthma, with persistent symptoms, and frequent exacerbations that required steroid burst & tapers. 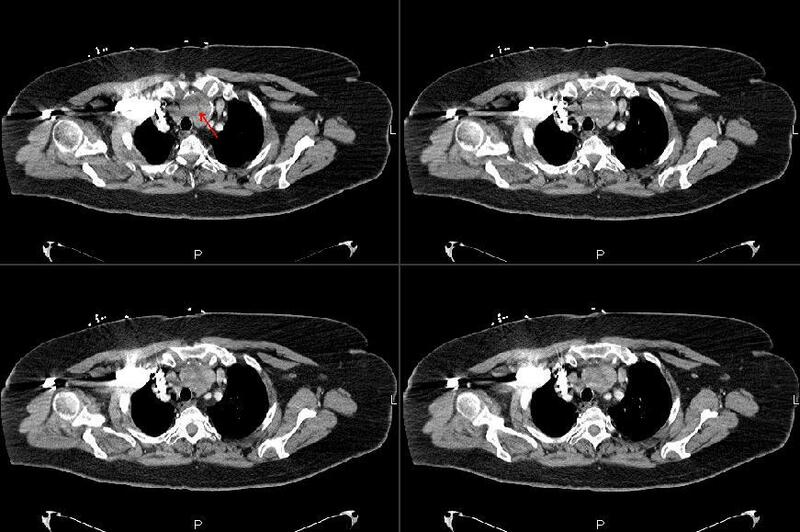 She was also quite obese and as a result had some restrictive physiology that was not accompanied by any evidence for interstitial disease on full PFTs and HRCT scans done on multiple occasions throughout the years. After a while I ran completely out of options for her. She was compliant on 6 puffs of Flovent bid, Serevent, Accolate (this was before Singulair), et., and was still ending up in an emergency room every 4-6 weeks. I started her on a drug that we shall henceforth refer to as "Mystery Drug". I had a biologic rationale for it, but NO DATA whatsoever, other than I knew it to be acceptably safe. I will see if anyone can guess what I started her an and why, then post some follow up. 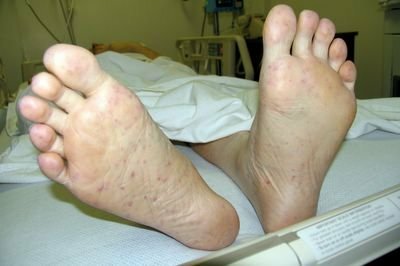 A 44 y/o woman was referred to me for possible atypical mycobacterium. Several years ago, she was diagnosed with MAC and treated for 6 months with Rifampin, Ethambutol, and Biaxin. Her therapy was stopped because of optic neuritis. Over the following several years, she remained stable, but in poor general health. Recently, she has developed recurrent sinusitis, and has had several complicated sinus surgeries. She was referred because of persistent cough. The remainder of her history is unremarkable, with the exception that she continues smoking regularly (1ppd x 20+ years). On exam, she is thin, but in no distress. Her general exam is unremarkable, although she has some scattered wheezes and rales bilaterally. 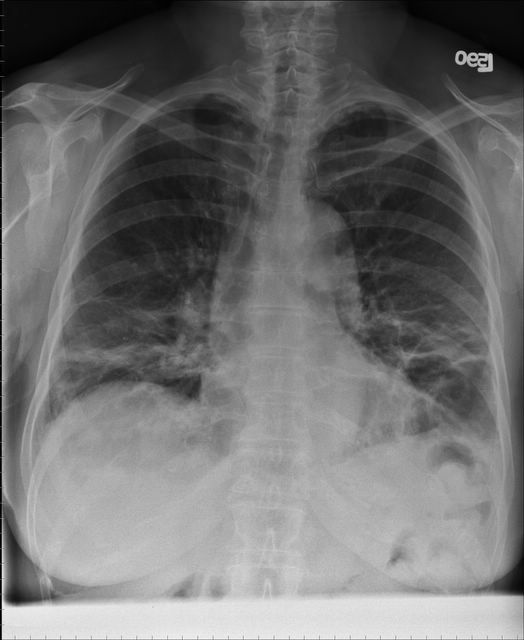 Her pulmonary function shows mild obstruction, with normal gas exchange. A high resolution CT scan shows mild bilateral bronchiectasis, primarily in the upper lobes, middle lobe, and lingula. This has been "Pulmonary Nodule Week on Pulmonary Roundtable"! 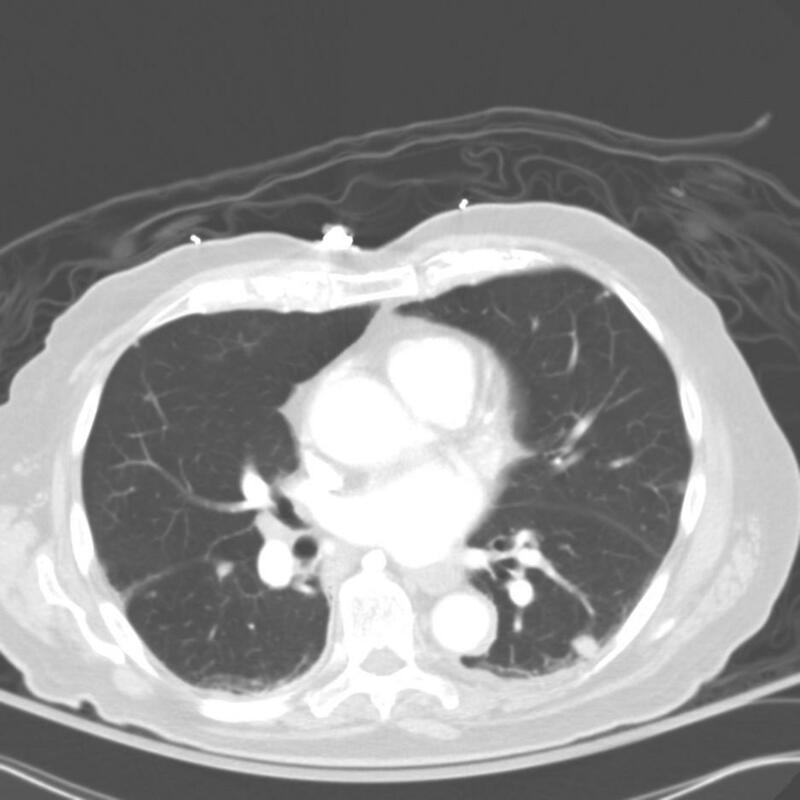 This is a follow-up on the 65 y/o former smoker with poor PFTs and the suspicious lesion. After the poor response to bronchodilators we did perform a PET: it revealed significant uptake by the nodule and no other abnormal areas. We discussed it with our CT surgeons who felt very hesitant about a lobectomy. Instead they did a mini-thoracotomy wedge resection of the area. It revealed a 2x2x1.8 cm poorly differentiated squamous cell-Ca. 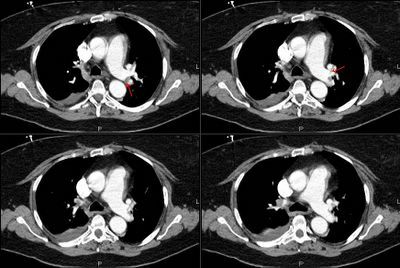 We have consulted hem-onc and since this was a wedge and not a full lobectomy they have recommended ChemoTx/xRt. We don't do RF ablation here so I felt the wedge with follow-up Tx was as close to it as we would get. She has done very well post-op and should be home soon (surgery was 2 days ago) with hem-onc f/up. This 49 y/o woman was referred to me with an anormal CT scan. 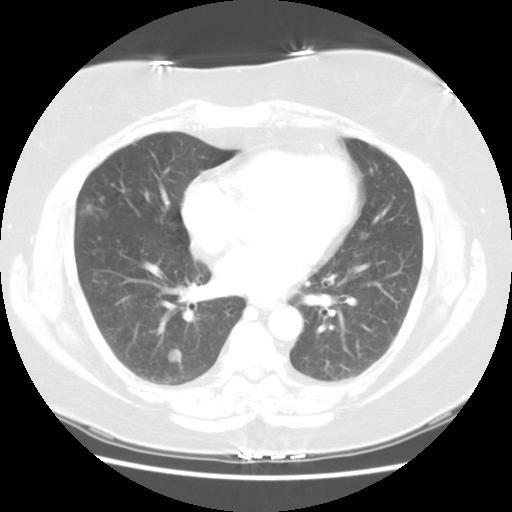 She has a 30 pack/year Hx and has quit smoking when told about the CT. She has no symptoms (she had had a "screening" CxR which prompted the CT), her exam is quite unremarkable and she has normal PFTs (FEV1 and FVC are >85% though the ratio is a bit low). 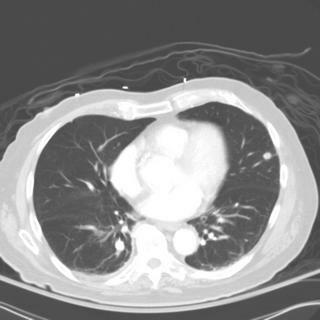 Her CT showed multiple non-calcified nodules (some a depicted below) with no adenopathy. 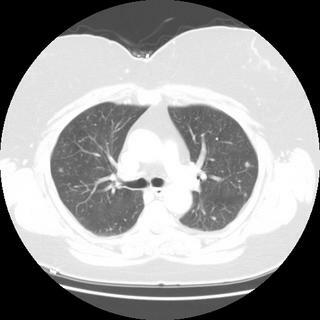 Meanwhile, Mike L has posted the f/up and diagnosis on his pulmonary nodules case. Check it out and leave your comments. This is a 65 y/o former smoker who was sent to us for evaluation of a pulmonary nodule. 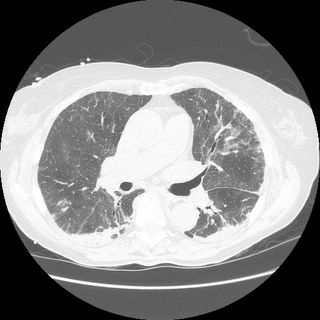 She has COPD, has baseline DOE and while having an AECB had a CxR (outside films). 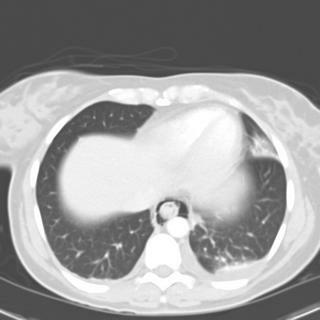 The CxR revealed a nodule which is better characterized on the CT below. She has had no F/C/NS, no hemoptysis. Her exam was fairly benign. Her FEV1 however, was only 700cc on Combivent? Doug picked up on the subtle clue of chronic UTI's on past history. Her shortness of breath resolved and the DLCO (which was 56%) became 86%. 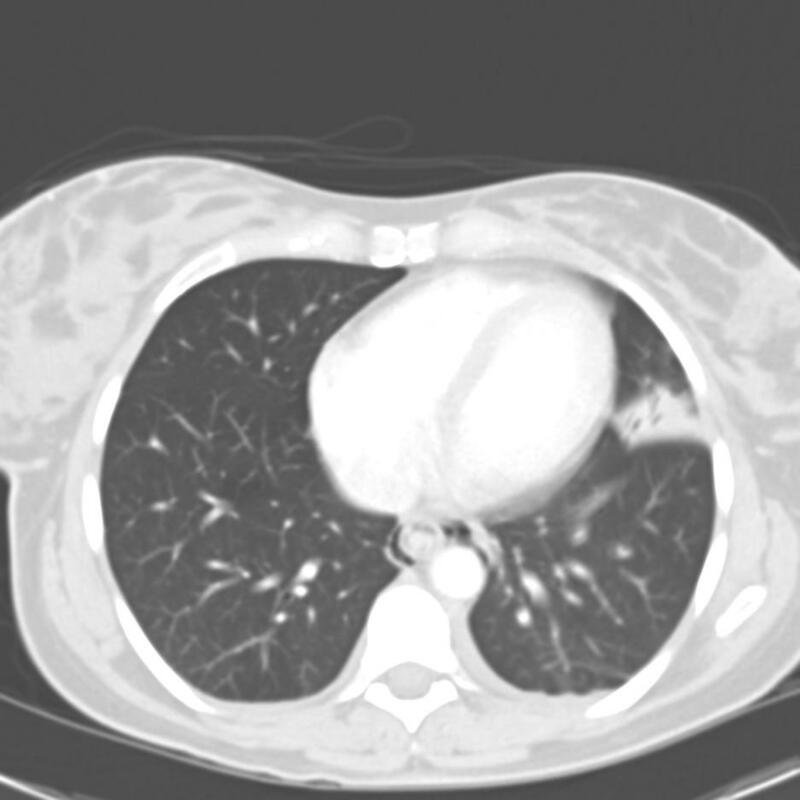 74 year-old woman who reports gradual onset of dyspnea on exertion over the past year. No chest pain, fevers chills or night sweats. She has a minor non-productive cough. ROS: Some minor arthralgias, probably OA; o/w unremarkable. PmHx: chronic UTI's followed by urology otherwise negative. SH: Lifelong nonsmoker. Occupation was secretary. FH: 2 daughters with fibromyalgia. Travel Hx: Thailand in the past year. 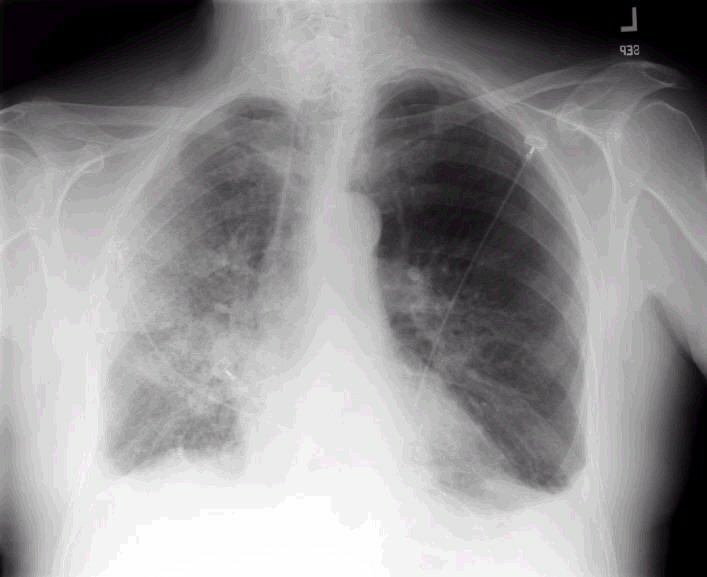 On exam initially the lungs were clear to auscultation, but subsequent exams over the next year revelaed bilateral crackles, as can be imagined based on xrays shown below. 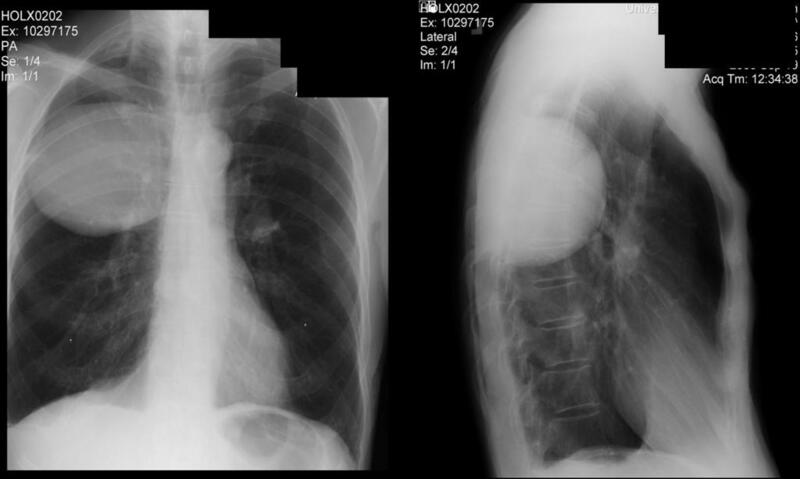 So over the next year she became more and more short of breath with the following progression on chest xray. CXR more months later with worsening dyspnea. RF and ANA were low in the past. 86 yo male with PMH of colon cancer dx 30 years ago s/p Left hemicolectomy presented to the hospital after a syncopal event. He had an URI about 1 week prior to admission and that had largely resolved with conservative treatment (OTC AH/DC). His syncope was probably related to orthostasis (frankly orthostatic on presentation). On hospital day #2, he complained of abd pain. A CT of the abd showed bilateral pulmonary nodules. 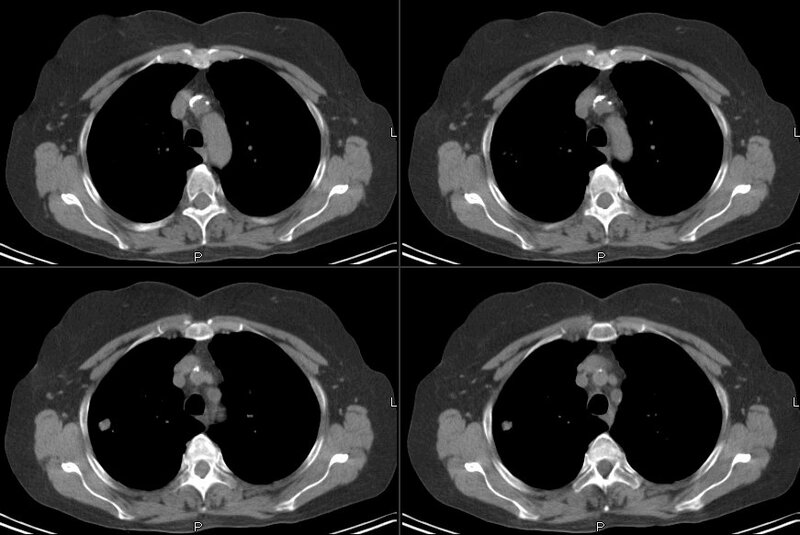 A corresponding CT of the chest (cuts below) showed multiple small pulmonary nodules. He is a lifetime non-smoker. His colon cancer was "cured" with surgery; an exploratory lapartomy 10 years ago for a PSBO showed adhesions but o/w was normal. A colonoscopy 1 year ago was completely normal. Remember this case of the Jehova's witness with the growing lesion in the RLL? A bronch showed some greenish secretions. The BAL was cloudy but colorless. It was negative for actinomycetes and nocardia (no growth x 6 days so far). There were 4000 cfu/mL of alpha hemolytic strep with > 1 PMN per oil immersion field. The cytology was read as "acute inflammation". Do you all think this whole thing is due to a chronic a-hemolytic strep infection? What causes a high IgE (4000) with only 1% eosinophils on the CBC with diff? We have a few posts still in progress (JJ's pulmonary nodules below and some of the smaller follow-ups) so I will make this a shorter post. 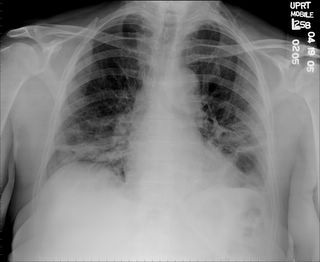 I had posted on this 55 years old, remote smoker (quit in 1978) with a chronic cough with a negative PET but a lung Bx on bronch + for NSCLCa. 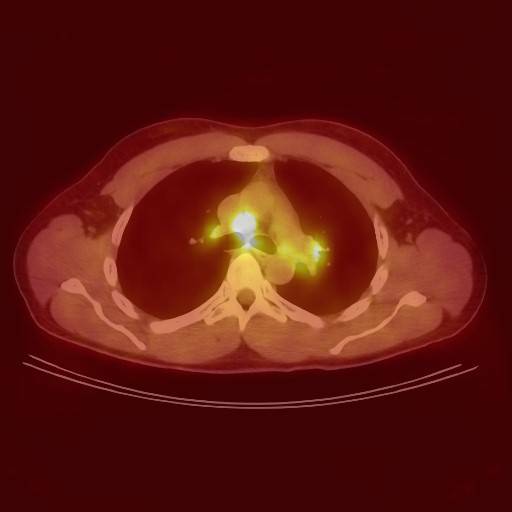 One of the suggestions was to do fluorescent bronchoscopy, however those expensive machines are not available here in TN... so I gave her some steroids (systemic and inhaled) and brought her back for a re-bronch. There was still some inflammation on the take-off of the RLL bronchus but no mass. I did a repeat bronch and sistematically sampled all the main lobar bronchi and brushed the RLL bronchus. EndoBBx from the left and the RUL had some mild chronic inflammation. The RLL TBBx showed mild congestion and the EndoBBx now revealed: "Extremely scant detached cells suspicious for non-small cell carcinoma present in detached mucus and clotted blood." This was reviewed by 3 of our pathologists. 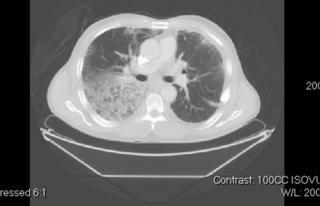 She has good lung function and the previous RLL EndoBBx revealed foci of what seemed like squamous cell Ca. 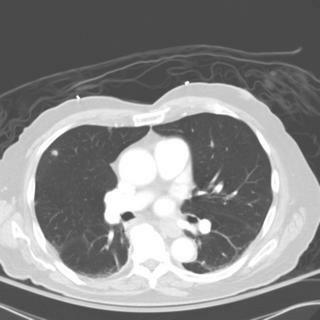 This is a 58-year-old woman who has carried the diagnosis of asthma for 5 to 7 years. She has been on Advair for that time. She presented with cough and wheezing. She has one ER visit per year. Her other symptoms are well controlled. No cough. No chest pain. Positive fatigue. No fever. No chills. No night sweats. The patient had an episodes of hemoptysis last year (coughed up bright red blood one-fourth of a cup at a time and the episode resolved spontaneously. The patient has had no hemoptysis since then The only workup was chest x-ray. PAST MEDICAL HISTORY: Allergic rhinitis and Asthma. OCCUPATION: Distribution clerk at a post office for 21 years. No occupational exposures. exposure. No alcohol. No illicit drug use. One of my patients today was asking about adjuvant therapy: he is only 47, quit TOB in 2001 and we recently diagnosed him with a squam cell Ca of the LUL. 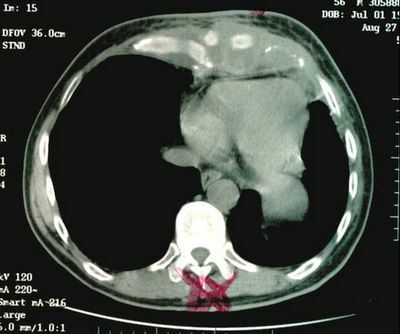 He has normal lung Fxn and underwent a clean, uneventful LULobectomy with a 1-cm tumor, clear margins and no involved nodes. 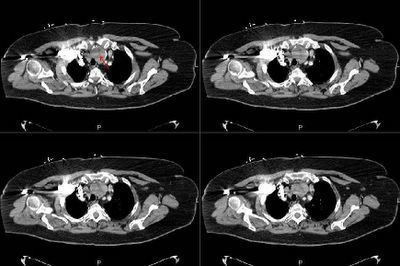 He is understanbly scared and was seen by one of our oncologists who pointed out that there is no data to support adjuvant therapy in his case. Do you know of any trials looking at adjuvant therapy for IAs? I had posted the CPET results on this 58 y/o woman with dyspnea. We felt she had exercise induced flow limitation with dynamic hyperinflation and started an aggressive bronchodilator regimen with a referral for Phase III Pulmonary Rehab. She came back for follow-up today: she hasn't started rehab yet because she had to go to Scotland to help care for her mother. She feels much better with the bronchodilators; her FEV1 and FVC though normal before are even higher (~10%) and her FEV1/FVC ratio went from 75 to 83. 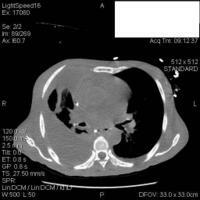 55 yo female from Africa developed pleuritic chest pain, dyspnea, and LE in early fall of the prior year. She was initally treated with ACE-I and Lasix. Her symptoms worsened. With additional water restriction she would respond but suffered repeated bouts and progressive worsening of the symptoms each time. She was admitted to an OSH with the above symptoms when visiting her daughter in the U.S. in July of this year. Ten pound weight loss noted over the last 6 months. Additionally, she had N/V, abdominal distension, and decreased urine output. Pertinent labs: Bun/Cr 240/18, K 7.6, HCO 18. On exam, significant edema with some skin breakdown and ulceration secondary to edema. CXR w/ large R. pl effusions. 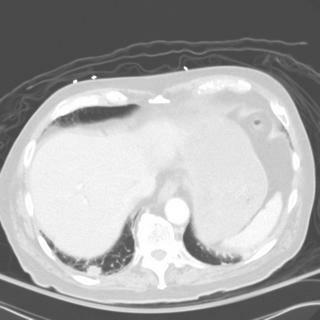 Abd U/S w/ small kidneys. Abd CT with diffusely nodular liver, EKG showed sinus bradycarda, low voltage QRS, small lateral Q waves interpreted as possible infarct. She was started on HD. R. Pl effusion was sampled and c/w exudative pl effusion, negative smears, PCR for MTB negative, ADA negative. Paracentecis negative cytology for malignancy. U/S guided liver Bx X2 performed demonstrated granulomas and possible intracytoplasmic organisms. Pt. developed respiratory compromise and was intubated after bradycardic arrest on the way to OR for VATS Bx. Pt. developed Serratia PNA. She was transferred to the MICU at our institution. What do your differential; any other tests? In case you missed the last update - this is yet another example of TB being sneaky. However, MTb should always be considered with any infectious presentation from abroad. 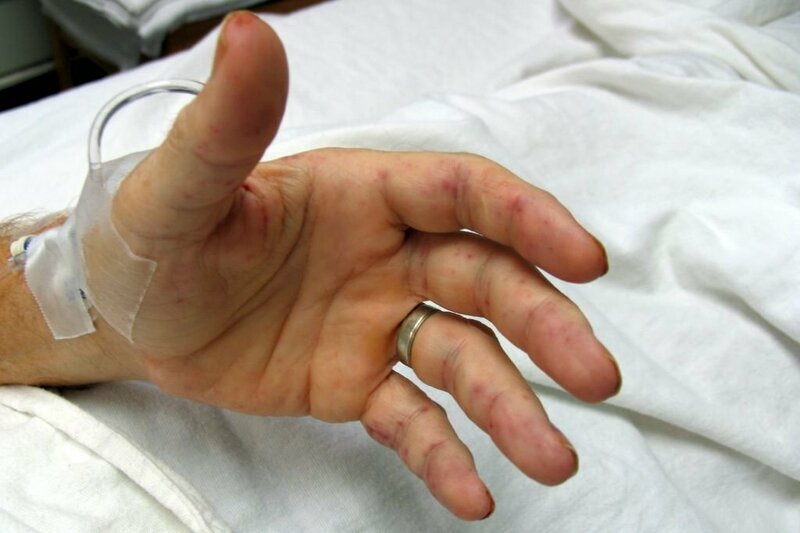 In this patient, chronic infection lead to deposition of serum amyloid A protein (SAA) in more than one organ. SAA is an acute phase reactant that can be seen in chronic inflammatory conditions such as rheumatoid arthritis, chronic infection, and Familial Mediterranean Fever. 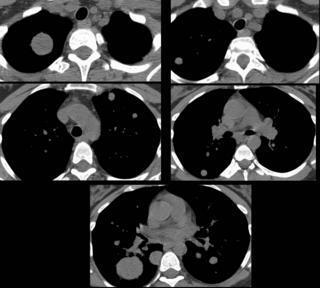 She was hospitalized and last night developed dyspnea and CP and the following CT images were obtained and we were consulted. What are the highlighted findings and what would you do next? 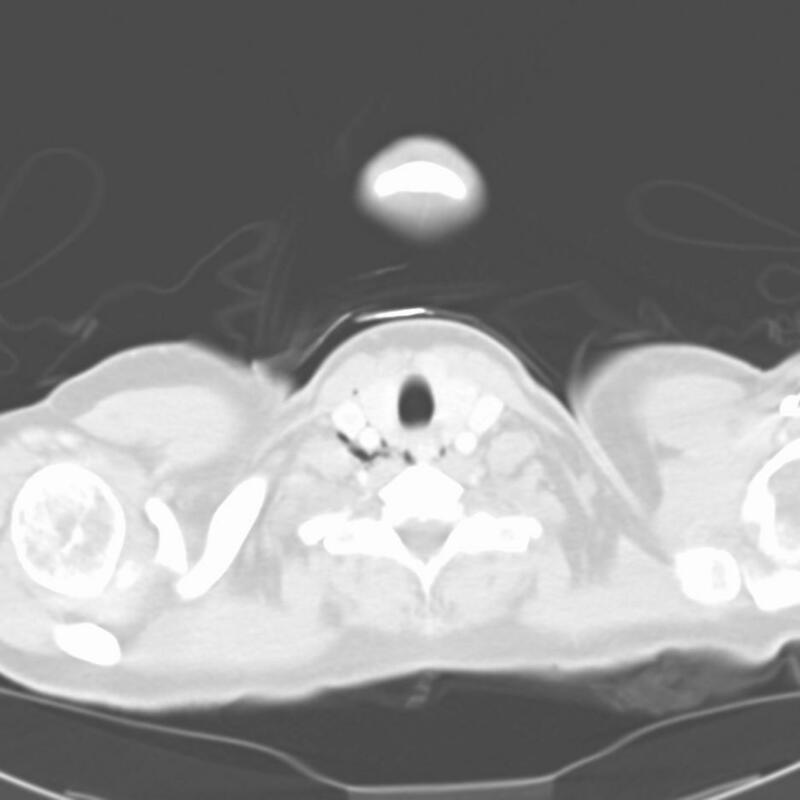 This case was very interesting to me because we actually got Cx results in this patient. JH pointed out that she did not quite cut as "severe" pneumonia from the description and I think we all agree. 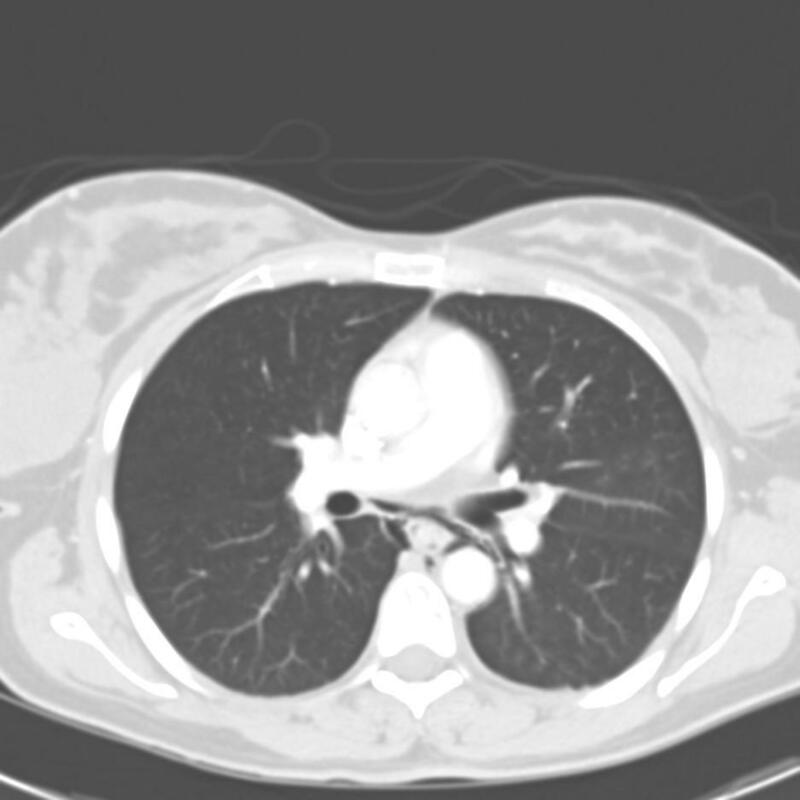 However, she was getting there: age>65, underlying lung disease... Also with her structural lung Dz, she is at higher risk for AECB and LRTI's with GNRs. Indeed, she got somewhat worse before she got better: she dropped her Sats and BP and we were called to transfer her to the ICU. I added Cefepime to her regimen and she started growing GNRs from her admission blood Cxs. She grew out Acinetobacter baumanii from her Cxs, improved with IVFs, BiPAP and ABTx and is now recovering. 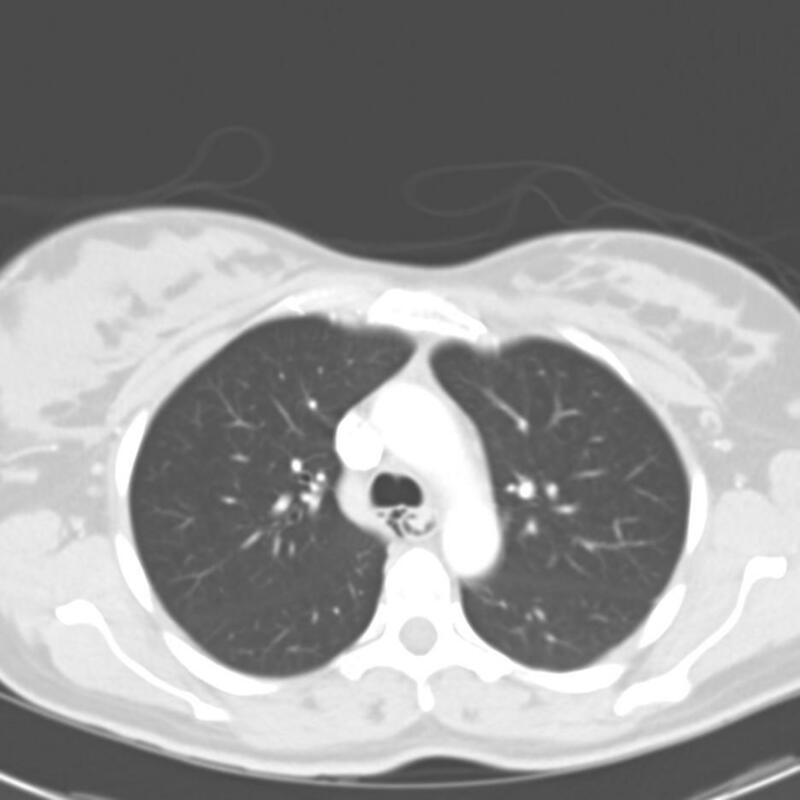 A 38 y/o woman presented with some wheezing and shortness of breath over 2 weeks. She had no other complaints. No weight loss. No fever/chills/sweats. No chest pain. No hemoptysis or hematuria. No arthritis/arthralgias. 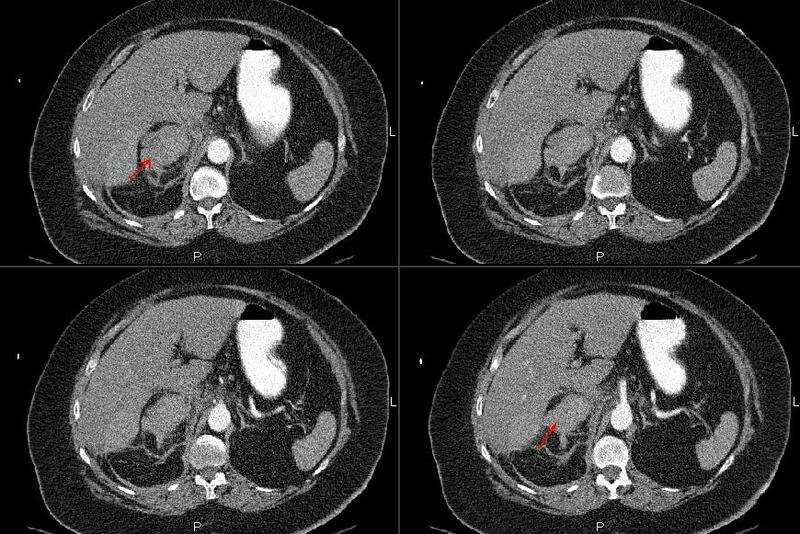 PMH was significant for a cadeveric renal transplant that had been done 23 (yes, twenty-three) years previously for reasons entirely unrelated to her current presentation. The remainder of her history is non-contributory. 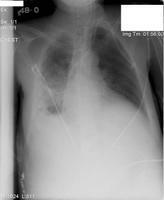 Notably, 5 weeks prior to this presentation, her CXR was normal. In all, I counted 17 of these nodules and masses. Morphologic and attenuation patterns were all similar, although the sizes were quite variable. So, what is the differential diagnosis and diagnostic approach. I will respond and update as some comments come in. Answer posted below in the comment section. 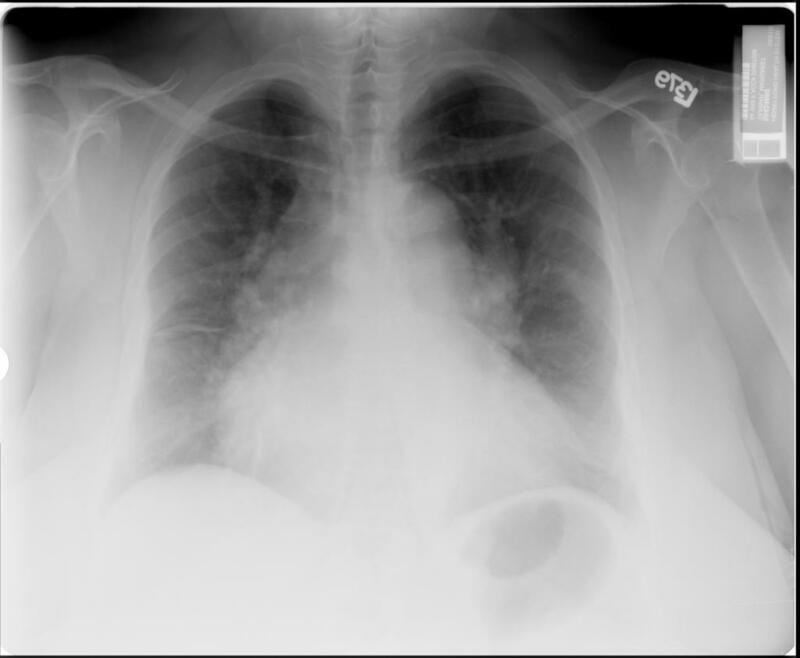 What would you do with an 80 year old with rheumatoid arthritis, no lung ivolvement, no lung symptoms who got a PPD prior to starting Enbrel and it was 20 mm? The CXR was negative and he has no constitutional symptoms. We could not elicit any history of prior exposure. He has not had any preious skin testing. He has no known rik factors. There are times when you need a quick answer or want some immediate feedback on a case of your own (maybe you are reviewing yur patients for tomorrow's clinic for instance or you need an answer by the end of the day). In these cases, when submitting the case to pulmonaryroundtable at gmail.com please put in the subject "FOR IMMEDIATE REVIEW" and your case will be move to the top and posted as soon as possible. This was an interesting consult. 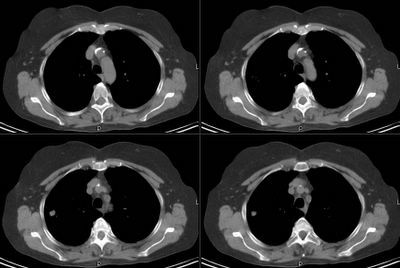 A 79 y/o woman with a 100-pack-year TOB Hx was admitted by her PCP with cough, dyspnea, fevers to 101 and malaise. 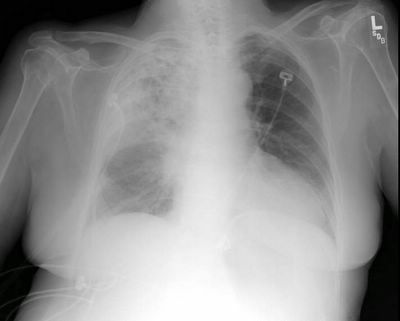 He obtained the CxR below and started her on Levofloxacin 500 mg/day. By the second day she was still having fevers (101-102) and did not feel much better. CxR was not much different. What would you do/change at this point? What are your thoughts? Pretty cool pics of a patient with subq emphysema. 2 Hours after intubation on AC 12/500 PEEP 5, she was doing well. No wheezing. Good airmovement. Peak and plateau insp pressures were not high and repeat ABG showed 7.37 pCO2 43 pO2 98 on 40% FiO2. She was extubated and did fine. Next step: a. discharge to floor. b. further workup and why? 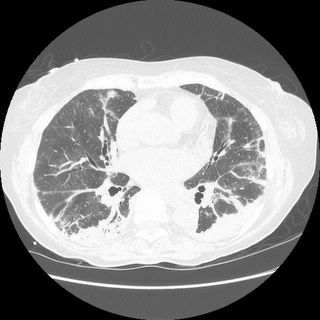 So I agree with the two comments that you don't biopsy a lung nodule in an otherwise good surgical candidate, which this man was. He of course went on to receive chest wall radiation starting two weeks after his surgery and finishing in late July 2000, which is of course why I met him in September of 2000, about two months after completing his XRT. He had a mild case of radiation pneumonitis with dyspnea, and cough. I treated him with steroids for about 9 months because of a tendency for relapse when I tapered him. He was then doing well for about a year, when he came back to see me becuase of a CT showing mediastinal and hilar adenopthy. He had two unseuccessful attempts at Wang needle bx including a very large pre-tracheal LN, because of this I referred him for a mediastinoscopy, but first ordered another PET to see if he had any other evidence of distant disease (PET LN jpeg file below). When he returned to see me to discuss the PET a week later he complained of some redness and pain on his anterior chest wall which I treated as cellulitis.He was set up for a mediastinoscopy, but when he presented for this appointment 5 days later, he complained of increasing pain and redness over his anterior chest even after taking Cephalexin for the last week. 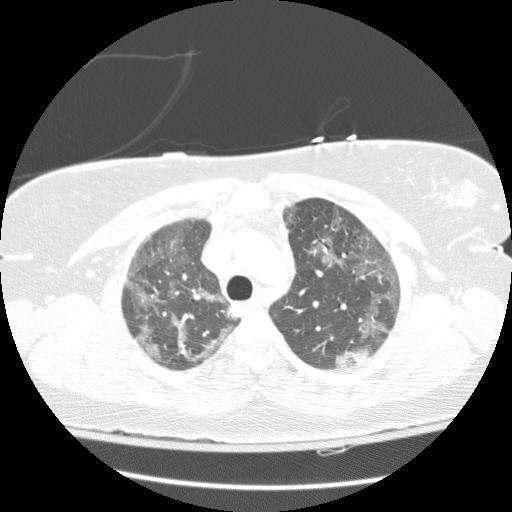 He had an admission CXR that showed a large soft tissue density and had the following CT scan the day of his planned mediastinoscopy. 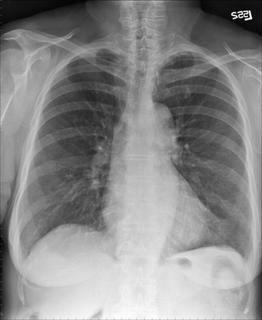 (9-02 chest wall image below). Now what would you do? Answer posted in the discussion below.